Tuesday was a great day for Iraq. For a country whose leaders have often disappointed, two exceptional people were tapped to be the highest leaders—in what was Iraq’s fourth peaceful transition of power since 2005. Barham Salih was voted by parliament into the position of president. His first act was to name Adil Abdul-Mahdi to be prime minister, conditional upon his formation of a government in the next 30 days. Some may see this duo as part of the old guard; both have been active in Iraqi politics since the fall of Saddam Hussein in 2003. Salih has been deputy prime minister of Iraq, and prime minister of Iraqi Kurdistan. Abdul-Mahdi was formerly vice president of Iraq and more recently oil minister. But both men stepped outside of traditional politics at different points, recognizing the shortcomings of the existing system and the need at varying moments to maintain their credibility and independence. 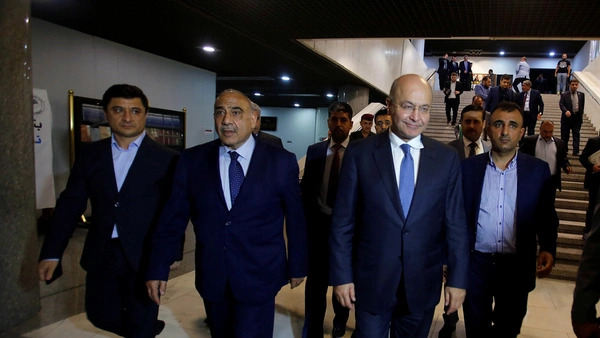 Although Salih recently rejoined the Patriotic Union of Kurdistan, he had recently launched a new Kurdish party, aimed at upending the existing power structure. Abdul-Mahdi, once a member of the Shi’a party known as Islamic Supreme Council of Iraq, has been an independent since last year—making him Iraq’s first independent prime minister in 15 years. Equally important, both men are people of integrity and individuals who know that compromise is required for effective governance. Moreover, they have real relationships with people from different communities and possess a quality often in short supply in Iraqi politics: the ability to imagine the needs and desires of a political adversary. Abdul-Mahdi in particular has a stellar track record of building alliances. Iraq’s leaders will need all these experiences and talents if they are to move Iraq to a new plane. There are reasons for optimism. While the threat from ISIS is not completely squelched, the group no longer has a geographic base in Iraq, and Baghdad no longer needs to channel all of its energies into the military campaign against it. Even Iraq’s budget situation is looking up. Whereas Iraq faced a budget deficit of $19 billion in 2017, the fiscal situation looks much improved for the coming year, thanks to increased oil production, higher oil prices and lower military spending. But the challenges facing Iraq’s new government are enormous. Large protests in southern Iraq in recent months show how many ordinary Iraqis feel their government has failed to deliver basic services. Corruption is rampant throughout the government. Tension between Baghdad and Kurdistan in Iraq’s north remains in the wake of the Kurd’s vote for independence last year. Perhaps most worrying, the scale of post-ISIS reconstruction needed in both Iraq’s west and north vastly outstrips the government’s resources and capability. The deepening animosity between the U.S. and Iran creates real trials for the Iraqi government, which is often wedged between the two. Iraq’s future cannot be guaranteed by two individuals, no matter how solid and well intentioned they are. Their success will depend on a wide range of forces, many outside of their control. One of those factors will be the degree of international support given to this new government. It is understandable that most Americans won’t see any reason to hope this government will be different or more able to solve Iraq’s complex problems than previous ones were. But hopefully U.S. policy makers will see that this new start for Iraq offers the beleaguered country a bit of a reprieve, and an opportunity to build on the many sacrifices made in Iraq over the last 15 years. The new government deserves all the support the U.S. can muster in these tired times.